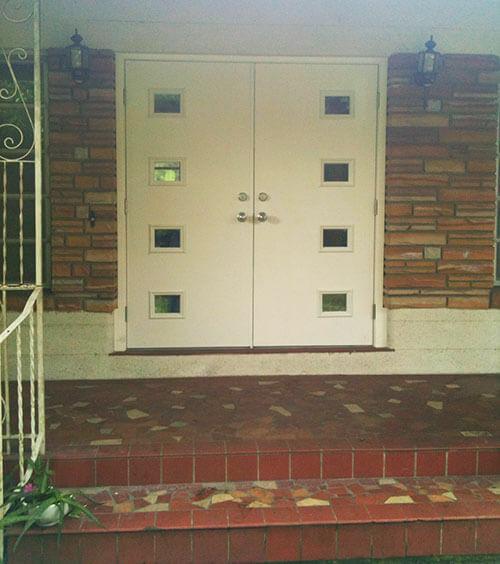 Big news: A mass-market door manufacturer has finally introduced a line of mid century style doors. 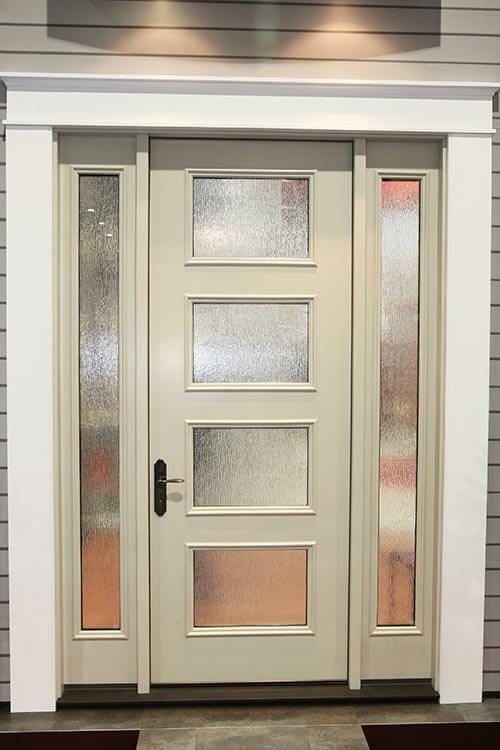 Yes, Therma-Tru has introduced a new line of retro style front doors. The new “Pulse” line of doors — available in oak grained fiberglass, smooth (paintable) fiberglass, and steel — come in four styles: the Ari, Echo, Linea and Solei. The doors are made in Indiana, Therma-Tru told us. 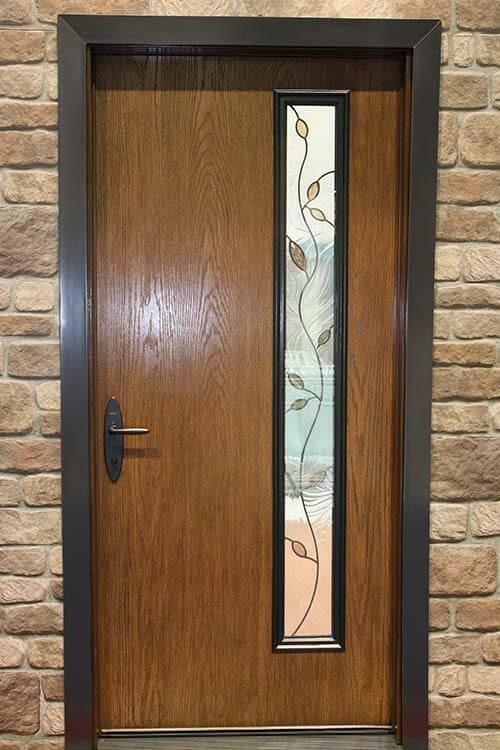 Introduced in late March (2013), these mid century doors from Therma-Tru are available in several sizes, two finishes of fiberglass(wood look or paintable) or in steel and have quite a few glass options. Up until now — we knew of only two sources for mid century doors — the salvage yard/ReStore or Crestview Doors. As many readers are likely aware, Crestview Doors has been the only active manufacturer in this segment for the past five+ years. And, while we are still trying to get a retailer to give us pricing (see pricing section, below), we are guessing that the mass-marketed Therma Tru doors will be available at a lower price point. UPDATE: Reader RetroRobin said in Comments that she just ordered a Linea with decorative glass and it was $530. It included the frame. She said that with plain glass it would have been about $100 less. We jumped over to Crestview and the comparable price for their similar Nokona door (prehung with reeded glass, delivered) is $769 (Update: There was a significant price increase during the summer of 2013. The Nokona door is now priced at $2,542). Accented with clean lines and crisp angles, Pulse entry doors cater to homeowners seeking to celebrate their own special sense of style. The contemporary door styles reflect four aesthetic feelings that many homeowners wish to capture in their home entry areas: Eclectically Chic, Mid-Century Modern, Retrospective and Distinctively Modern. “These were the show-stopper doors in our booth at the 2013 International Builders’ Show,” says Derek Fielding, senior product manager for Therma-Tru Corp. “Pulse doors capture a modern feel, but at the same time bring you back to the 1940s through 1960s when door styles were simple. 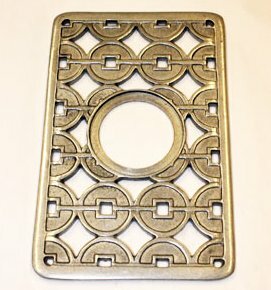 Pam gasps: No inserts like this, please, if you’re trying to be true to mid century style. Available in oak-grained fiberglass, smooth (paintable) fiberglass and steel, Pulse doors come in both 6’8″ and 8’0″ heights. Therma-Tru offers the Pulse door line in four different styles — Ari, Solei, Echo and Linea. The doors all have four Privacy Glass options (Chord, Chinchilla, Rainglass and Granite) along with Clear Low-E and Internal Blinds. The Linea style is available with these same glass insert options plus decorative glass options of Blackstone®, Crystalline™, Sedona, Salinas®, Element, Maple Park®, Avonlea®, Saratoga™, Texas Star, Arden® and Crystal Diamonds™. Pam says: I’m not so keen on the rain glass either. Just get the CLEAR glass. One of the most important pieces of information is that homeowners are entitled to up to a $500 federal tax credit when they order ENERGY STAR qualified doors in 2013, which Pulse qualifies for! [EDITOR’s NOTE: Crestview told us that they also can work with customers to specify and design a door that qualifies for this tax credit. Also note — check the rules of this tax credit — it is our understanding that it is a one-time only credit that does not carry over to subsequent years.] Pricing information is a challenge for us, because we’re the manufacturer and don’t set the retail price for consumers. Plus, there are SO MANY variables based on the size ordered, glass ordered, location, etc., that it’s really not possible for us to supply you with this information. Early last week, I called a local supplier and asked them look up the price for a 3′ x 6’8″ Linea style door from the Pulse line with Rainglass insert — the style and size I would choose if I were replacing my own front door. When I followed up, they told me the doors were not yet in their system, and that they would need to do more research. So be forewarned, readers: Because these doors are pretty new-to-market, you may need to press to get prices and service on them. If anyone is truly in the market — and is successful at getting prices — we’d love if you could share the info in Comments. Thank you! In addition, my local retailer did not have any of the doors on display yet. If you are like me and are not familiar with the look and feel of fiberglass doors — or, if you are pretty sure you’d like to see the door first — you might want to try and track down a showroom with this line on display to see how they look in person before making a decision. … The polyurethane foam core [of Therma-Tru’s fiberglass doors] offers up to four times the energy efficiency of a wood door and contains no CFCs. A solid hardwood square edge for strong performance that reproduces the look of a real wood door surrounds the foam core and a wood lock stile runs the entire length of the door to add structural integrity and heft. Covering the insulation materials is a door skin. Fiberglass door skins can be made to replicate real wood (which can be stained and finished easily) or come in smooth, paintable surfaces. 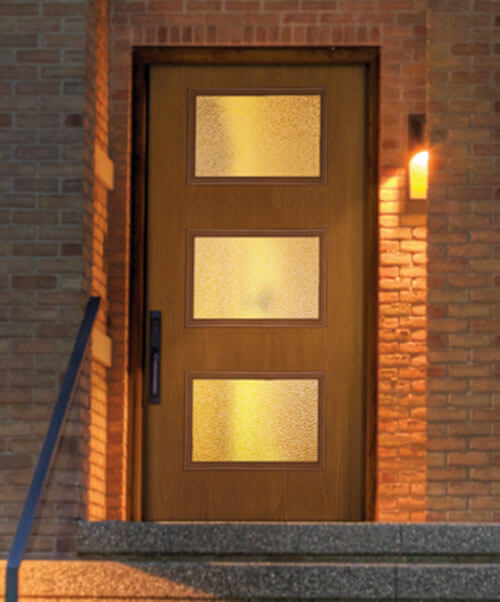 The fiberglass door skin resists denting, cracking, splitting and splintering. It also resists rust, shrinking or swelling with temperature changes, or warping. 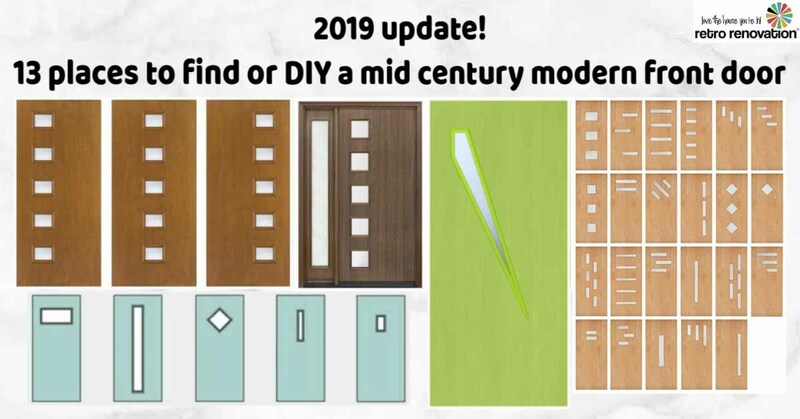 I have to admit we are excited to see the popularity of mid-century modernism gaining since we originally published our carefully-researched catalog of mid-century modern door designs in 2007. But what really sets Crestview apart from other door and millwork companies is in our commitment to service. Our designs are created with careful attention to period details and geometric perfection. We are committed to quality across all products and all levels of design and manufacturing. We sell our products via the web so you can have unlimited access and flexibility to managing the decision-making process. If that’s not enough, we have trained and qualified renovation professionals answering our phones right out of our manufacturing facility here in Austin, TX, where we handcraft all of our sustainable wood products. They will go out of their way to help you source the ideal materials to achieve the desired look. We are proud to represent mid-century and modern design, and we recognize the importance of balancing tradition with innovation. We have expanded our product lines based on customer feedback to include elements from the pre- and post-war eras as well as contemporary interpretations of modernism, and we will continue to aggressively innovate on behalf of this movement. We look forward to sharing products and services that are unmistakably Crestview with the MCM community. Yes, the Retro Renovation universe of product alternatives for mid century modern and modest houses continue to expand! See Sarah’s DIY solution — she had solid slab doors and worked with a local glass company to add lites. All of our stories about front doors and other accessories to add to the curb appeal of your mid century house are here. Interesting and definitely worth watching to see how these doors do in the marketplace. I’ll have to admit that I’ll always be a Crestview fan. I love the story of how they started the company and they’re such nice people. I’ve been looking for a replacement to the horrible fiberglass door that is on my rental ranch. I’m trying to bring back some of the MC charm that people have deleted in the past. I’ve researched Crestview and decided that I would eventually purchase a plain door from them and a door light kit and do it myself. Much more cost effective that way. This story got me quite excited. Maybe this would be an even cheaper alternative. So, I did a little searching and come to find out, one of the big box stores that we’re all familiar with sells Therma-Tru doors. Actually, they sell the door that I have. Well, it looks like their doors range anywhere from $700 – $850. I would assume that since this is a new style, pricing will probably be on the high end of that if not higher. Crestview looks like it will be the most cost effective option for me, despite any insulating benefits from the fiberglass door. Nate – Doors (outside of air sealing) are one of the things everyone gets up in arms about replacing for insulating needs…but it is one of the smallest contributors to energy loss under most circumstances. If you have a decent wood door that has good weatherstripping (piping on sides, channel strip on bottom that mates to the threshold correctly) and a storm door you will only see very small to moderate benefits from stepping up to an insulated door. Windows are the same way – a good single pane with with a good storm is nearly as insulating as a brand new double pane insulated glass window. Window replacement payback (cost vs energy savings) is very tough to make work. Readers, I remind: Consult with a properly licensed professional on these issues. Last summer, my husband retro-fitted our plain Jane 1954 original wooden front door to make it look very retro for about $200. He found a place in our area who sold 12″ x 12″ square door lites and bought 3 of them. He turned them to a diamond shape and spaced them evenly down the length of the door. They came with clear glass but we needed more privacy so we took them to a mirror and glass shop and had a textured glass cut to fit. Hubbie then took out the clear glass and installed the textured glass himself. I was very nervous when he made the first cut into the door to install the door lites, but after a new paint job, our door looks just like a Crestview door at a fraction of the price. Something to consider for all your DIYers! Janice, I’m sure that looks great. I’ve thought about doing something similar myself. Unfortunately I don’t have a plain door to start with. I’ve looked for plain doors and even have my neighbor looking for me (he is a manager at one of our HFH ReStores). It’s weird to thing that plain, solid doors are so hard to come by. Sounds like you got lucky to start with a blank surface! I am thinking you sent me photos of this, Janice. Am I remembering correctly? I will go look and try to show the project. Thanks for the reminder! HI Pam, yes, I think I did send pictures when we finished the project. 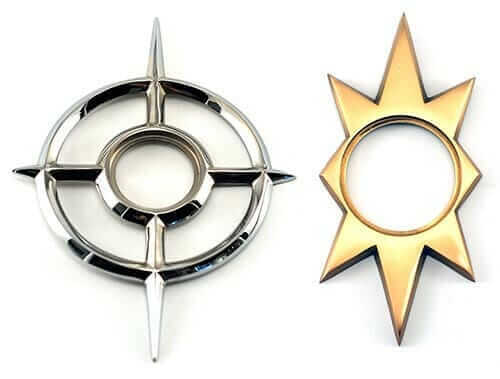 Let me know if you can’t find it and I’ll see if I can locate them on my end. Thank you! The linea right and left put together as double doors looks just like my doors that we made custom for my front porch makeover!! I couldn’t find anything MCM or even just modern when I was door hunting locally, nice to know there will be more options for the next person. These styles are great for true MC modern, not so much for MC modest which is the home I have. As others have commented, it’s the weather stripping on doors that’s most important especially in cold climes. Since my door is solid wood and still airtight, I haven’t made an effort on replacement. I don’t want a fiberglass door and new solid wood doors have become expensive. You can still obtain them through old fashioned lumberyards. It seems most people have bought into the marketing of steel and fiberglass doors for insulation and security. Yeah in the Philadelphia area I’ve almost never seen flush doors on midcentury houses. My grandfather’s split level had flush interior doors but paneled exterior. I have a friend who lives in a very mid-century modest “air lite” rowhouse in the city, with a door made of V grooved planks with three rectangular glass panels at staggered heights. It sort of reminds me of a hybrid between MCM and (much fancier) 1930’s tudor.